The re-establishment of diplomatic relations with Cuba is, on a number of counts, a new masterstroke by Morocco’s King Mohammed VI, after his feat of arms that allowed his country’s triumphant return to the African Union (AU), commented a Western diplomat based in New York. The re-establishment of diplomatic ties between Rabat and Havana, after nearly 40 years of severance, put a wet blanket on the leaders of Algeria and the Polisario, who have not yet assimilated Morocco’s readmission to the AU, said the same diplomat who spoke under anonymity. 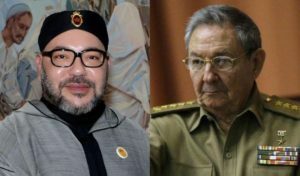 The recognition of the pseudo-Sahrawi republic “SADR” by Fidel Castro’s Cuba in the 1980s had been the direct cause of Rabat’s decision to severe diplomatic ties with Havana. The Polisario leaders try, once again, as they did when Morocco was readmitted to the AU, to reassure the Tindouf camps populations, claiming that the restoration of diplomatic relations between Morocco and Cuba was made “without conditions”, which is a “victory” for “the Sahrawi cause”. But the camps inhabitants are not fooled by this kind of talk. Supporters of Lamine El Bouhali, the staunchest opponent to the Polisario leader Brahim Ghali since his election, accuse the Front’s leadership of continuing to chase after idle dreams. The Polisario’s dissidents and opponents in the Tindouf camps agree that the ongoing turnaround is obviously in favor of Morocco. They cite, among others, the resounding breakthroughs of Moroccan diplomacy in Africa and the changes at the level of the United Nations with the departure of former Secretary General Ban Ki-moon and his personal envoy to the Sahara, Christopher Ross who both openly supported the Polisario’s independence claims. In this vein, the report that the new UN chief, Antonio Guterres, submitted to the Security Council earlier this month, put a wet blanket on Polisario leaders in Rabouni camp and on Algerian rulers as well. The Western diplomat believes that Morocco, despite the points it scored, has to be relentless especially on the African scene, where the Polisario still enjoys the support of Algeria, South Africa and some of their cronies. He argues that it is in the black continent that Morocco should deliver its final battle to close the chapter of completing its territorial integrity.